Join us live each week at www.productivity.academy/live and get your questions answered by submitting them at anytime right here: www.productivity.academy/questions. You can watch the video for the past episode recorded on July 5th, 2018 above, or you can review the transcript below. Is it possible to play World of Warcraft while maintaining a healthy, productive life? In GTD, what exactly is the benefit of adding new tasks to the inbox first, then at a later time processing them with tags, due dates, details, etc.? Why not do this while adding the task? All right. Hey, everybody. I’m going to flip over here to the webcam here, getting this set up. Trying the new streaming again, and it looks like it’s working so hopefully everything syncs up. Anyways, welcome to the Productivity Academy Live Q&A. If you’re joining for the very first time, first of all, thank you for joining the group, and if you’re watching this on YouTube, thanks for checking it out. You can subscribe just by clicking the button below if you want to stay up to date obviously with new videos like this as well as app reviews, process information and automation, all that good stuff. Then if you want to come live and join us in the group, you can find that link below as well. It’s a free Facebook community. 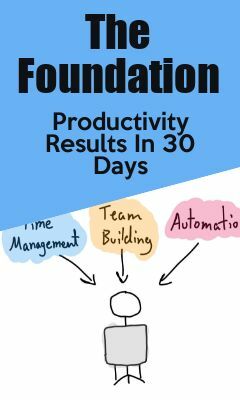 You just have to answer a few questions that show me that you actually want to be in the group and you’re not just clicking a button, so if you can handle that and you’re into productivity, time management, process, all that good stuff, then this is definitely the place for you. Today, I’ve got a couple of questions I want to cover, and then we’re going to go into using Trello to set up for VAs and employees. This is something that gets asked a lot as far as how to actually do this and the specifics behind it. Trello’s a really flexible tool, but I found that one of its most powerful uses in the beginning for people is to do task or project management. You can do this with single people or with groups. It’s really a great way to get started. You don’t need some really complicated project management software. As far actually you being in control of project, you might need some additional work or tools, but for managing others and just tracking some fairly basic tasks up to more complicated, even things like content schedules, publishing, all that. We’ll get into that, but like I said, let’s get into the questions first. The very first question was, this person asked, “Hey, I’m in my late 20s and feel like I’ve wasted a lot of time. Is it too late for me to achieve something worthwhile?” Yeah, that’s tough. I think everybody feels this at some point. You feel like you’re behind the curve, and everybody else is ahead of you, and it’s too late for you to do something great. It’s never too late. To be honest, I didn’t even go back and look for some really specific examples because it’s something I’ve felt. I look like… Right now, I’m 38 years old. Hey, is it too late for me to be making a video and putting it on YouTube and to put out a course on productivity and a cheat sheet on what’s the best way to do X, Y, and Z because I’m just now realizing that oh, this is something I know that other people could benefit from? Of course not. Would that have been neat 10 years ago? Sure, but it didn’t happen for me then, and so now is the next best time. It’s the same thing for yourself. It’s figuring out what you want to do and what it is that’s important to you, what are your goals, and realizing why do you feel like you wasted a lot of time. Maybe you literally did, and in that case, that’s awesome because now you realize that, and you’re not in that same place where you’re just oblivious or you’re just drifting. Now you can figure it out what it is you want to do and get to work. To be honest, I think that’s a great place to be. Second question. This is good. Sorry, laughing at this because I can identify with this. “Is it possible to play World of Warcraft while maintaining a healthy and productive life?” I will say yes. It definitely is. I think you can do anything while maintaining a healthy and productive life. It’s just maintaining control. I’m not going to lump World of Warcraft into things like drinking too much or binge eating but… Actually, I will a little bit. If you have an addictive behavior or you are an addictive type of personality, then these things can be difficult. These games are made to be very enjoyable to play. There’s always the next step. There’s something you can do. I have played World of Warcraft. I have an account. I love playing video games. I love tinkering on my computer. I’m that sort of a person, but it’s just one of those you’ve got to hold in check and just… Again, you can do this like a lot of things by looking at what are the benefits. I’m not going to go into my personal ones because it’s literally a whole long conversation I could have with people about why I think video games are so neat, but there is an upside to my life with it. I enjoy tinkering with my computer. I like building PCs, and I think it’s neat to check out these games. If I play games for 10 hours a day, that is not beneficial. That isn’t doing good things for me, and it doesn’t lead me to living a healthy and productive life doing all the other things that I enjoy too. I think, yeah, the answer’s you can do this, but like anything, you need to set up some sort of goals or limits. Is it, hey, the longest I can play is two hours. I just set a timer, and whatever it is. You know yourself best. Can you watch a clock? Do you hate having a countdown? Do you maybe just want to limit to the weekends so you’re not staying up late and waking up tired? Those are all things you have to answer for yourself, but I think like anything, almost anything, I guess, you can do to some extent and still have a good life. That’s my two cents. Last question. This is good. “In GTD,” that’s Getting Things Done, “what exactly is the benefit of adding new tasks to the inbox first, then, at a later time, processing them with tags, due dates, details, et cetera? Why not do this while adding to the tasking?” or sorry, while adding the task. Just write that down, and then deal with it later because the longer you take to deal with that, the more off-track you’re getting on project A, which you were originally working on. The whole idea here is focus and being able to continue on your train of thought or where you’re at without getting pulled out. It’s totally normal. We all have these thoughts. You’ve got other inputs, you’ve got things going on, but then again, just coming around that idea is get out of your brain, get it into your system, whatever you have, if it’s Evernote, if it’s a notebook, whatever it is, where you can deal with it later. Think the good goal behind that and something that I certainly practice, whether it’s little notepads, whether it’s my notebook, Todoist, but then obviously, and one of the points of GTD is to then collect everything and have a system for processing it later because that’s the part. If you don’t have that, then you’re in trouble if you’re just randomly putting things down everywhere. Good question. Okay, so switch over now, and let’s talk about some Trello. I think that this is a really good place to get started. If you haven’t used Trello before, I’m not going to tell you to go out and try something brand new today, but if you have employees, you have VAs, or even for yourself, for anything from content publishing to getting some maybe some more complicated task than just a single line, and especially if you’re using things that have checklists, there’s some great things you can do with Trello. This comes up a lot that people are asking, “Oh, how do I set this up? How do I use this best? I hired someone to work part-time for me remotely. How can I do this?” Let’s talk a little bit more about that, and I want to show you exactly how this can work and how you can do this for yourself. Let’s go look over here. We’re in my account in Trello. I’ve just set up a couple things real quick. What you’re seeing, in case you’re not familiar with this, this whole area is called a Board. Within here, you have lists. Let’s say I added a bunch of cards. It would just continue down this direction. These are individual lists, and then you can see “Add a card,” “Add a card.” I’m just going to put one, two, and three. You can see it jut goes down. That’s why it’s called a list. For just this example, let’s say we have VA #1. Obviously you could put someone’s name. VA #2, Need Help, Completed, and Templates. Let’s say you have a task. You come in here, and you could write a description. I want to say that “here’s an overview of the task,” and then maybe a checklist because you have three things you want them to do, or four in this case. Now, you assign that to a VA. Now, you might be thinking, “Well, how does a VA find out about this?” Well, you have to have them join and invite them to the board, but then you can have them watch the list. I’m sorry. You can click and go Watch. VA1 should be watching this board. All that means is they’re going to get notifications about anything that goes on in this board. When we created these cards, VA1 would get notified about that. That’s up to you how you want to set that up personally. I also like augmenting this with IFTTT, or Zapier. That can give you a little bit more customization instead of a Trello notification. For example, maybe you’re working with them in Slack. You could automate that, or an email goes to them and says, “Hey, here’s the details of what was added,” or if things are edited. The exact same thing for VA2. I’m not going to go into this. I just wanted to show you that this can work with more than one person. Need Help is a very common one, and this should always be in there. You can obviously call it something different, but this way, the VA doesn’t need to maybe ping you directly, whether it’s an email, but they can move the card. Let’s say the VA went through, and they got number one done, they got number two, but they’re confused, or maybe number three was incomplete, or they just are stuck. Then they could just move it over here, and this is one where you would want to watch it. I’ve already gone through and set yes, I’m watching this, because I want a notification when they have a problem. Then you could come back in here and say, “Okay, number three is now okay,” or whatever you did. If you want to do it that way, click Save. You can also mention people in Trello, so you can use the @ symbol and mention people. Very flexible. They could go back. They can pull it back, and then continue working on it. Then when they’re done, they can click on Completed. Of course, what happens at this point is very much up to you, whether you just want to be notified if something’s completed, if you have a project manager they need too, or you could have perhaps a list for projects. There’s a lot of flexibility, but I wanted to show you the most simple way to set this up to start with. Now, one thing that I want to spend one more minute on is if let’s say you have recurring tasks. Then you might want to have a template. I’m just going to call this Template Task 1. We’re going to say that this is something very common. Again, I’m just going to add some blank text here. Now, what we can do is a couple things here. You could come in, and when this comes up again, you could copy it, and you could say which board do you want, that’s this board, so we don’t want to change that; which list, we could say, “You know what? We’re going to sign this to VA2 in Position 1, and we’re going to call it, it’s not a template anymore. We’re going to call it Task 1.” Then it even asks you do you want to keep checklist. Super neat. We could go ahead and create that. Close this out and go look and boom, right there. Now we could go in if we need to. If there’s some customization in here, we could add that in there and do anything else we need to do. Then something else you get even for free with Trello, you get one of what they call Power-Ups. If you want to pay some more for their business class, yeah, I believe you can use, it might be unlimited Power-Ups, but for today’s purpose, I mean, you could do all of this stuff for free, and then you could use a Power-Up. They have a bunch of these, but the one I want to show you is repeat, Card Repeater. What this does is what it says. It automatically creates duplicate copies of Trello cards at set intervals for repeated tasks. Now, the reason this is so cool is let’s say that this task, and we’re now going to put it on Monday, is something that happens once a week, and we want the VAs to do it, but we also want to make sure that they have a checklist, they can check it off, they can move the task to Need Help or Completed. Well, what we can do with this is now we see under Power-Ups, we have a repeat. We can do it weekly. Guess it’s not showing up there. You can pick the time, and then you can pick the day. Obviously for us, we’d say Monday. I’m going to say, let’s go with 9:00 a.m. You can choose … Hmm. Might be because I’m streaming. It’s not showing, but you can choose some different, every week, every other week, every month. Then again, you choose the list and where you want it to go. In this case, we would choose the list we want, which might be one of the VAs, and then the position where we want it to go. You just click Save, and it’s got in there. Now you can see up here, Next Repeat, and go in here, and again, if you ever need to edit that. Really powerful. This is the basics, and this is a great way to get that set up so that you can start working quickly with VAs instead of having to do the email back and forth or even Slack or Skype. It’ll drive you crazy. If you have any questions about this, feel free to drop a comment or join the group and ask, but this is the basis for starting a easy and it’s a free way to set up project management and to be able to working with a smaller number of VAs or employees to get this done. Then you can start to imagine, okay, well, what if I put someone in charge who’s running that for me, like a project manager, and then have it monitoring VAs for me, things like that. You start building these tiers up, and you can see how this really helps. Hopefully, that helps. That’s the quick-and-dirty guide to using Trello for outsourcers and employees. As I mentioned, also, Zapier and IFTTT. The really powerful stuff with that is the ability for really customized notifications, but you can also then start to automate some of the ways where cards are moved or data is taken in and out of places. Again, it could be something like you have a weekly admin task that needs to be done, so you have that pop up in Trello and is assigned, and then when it’s done, perhaps that part of the task is some information is added. Then you could set up a Zapier/IFTTT applet that takes that information out, adds it to a spreadsheet, does whatever. Sky’s the limit. Again, I don’t want to overwhelm. I just want you to see that this is a really good way to get started and manage. Hopefully that was helpful. All right, I’m going to hop back in before we wrap this up, and make sure that there’s no questions. All right, we are looking good. Thanks for watching. Again, if you’re on YouTube, you can click the subscribe button, stay up to date. You can also come and join us in the free Facebook group after answering a couple of questions, and that link is also below. Thanks for watching, everyone, and I will catch you next week.